If you would like to record phone calls using multiple analog lines please click here. Setting up a single line analog system using a direct record adapter is easy. Just follow the instructions below, and, if in doubt, refer to the diagram (left). Using a telephone double adapter, split the phone line so that one line connects to a telephone and the other connects to a direct recording adapter. Download and install either the VRS Recording System or the TRx Phone Recording System on your computer. Setting up a single line analog system using a Voice Modem is easy. Just follow the instructions below, and, if in doubt, refer to the diagram (left). 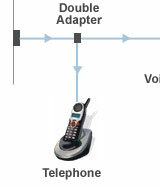 Using a telephone double adapter, split the phone line so that one line connects to a telephone and the other connects to a voice modem. Connect the voice modem into the back of the computer. Download and install the TRx Phone Recording System on your computer. 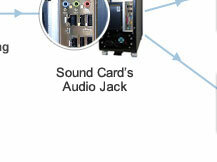 Setting up a single line analog system using a Professional Telephony Card is easy. Just follow the instructions below, and, if in doubt, refer to the diagram (left). 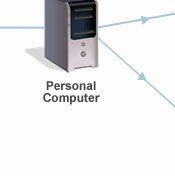 Firstly, ensure that the professional telephony card is installed on the computer. 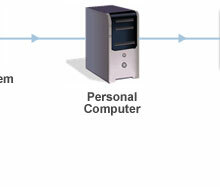 Using a telephone double adapter, split the phone line so that one line connects to a telephone and the other connects to the back of the computer via the professional telephony card.